Married Name 24 March 1904 As of 24 March 1904,her married name was Krug. Mary Alice Fish was born on 18 September 1875 at Winfield, Sauk, Wisconsin. She was the daughter of Lewis Fish and Sarah Darrow. Mary Alice Fish married William H. Krug, son of William Krug and Doris Hinrichs, on 24 March 1904. Lewis Fish married Sarah Darrow. Married Name Her married name was Fish. Sarah Darrow married Lewis Fish. Raymond Walter Krug was born on 7 May 1905. He was the son of William H. Krug and Mary Alice Fish. Raymond Walter Krug married Sarah (?) on 24 June 1927 at Colorado. Married Name 24 June 1927 As of 24 June 1927,her married name was Krug. Sarah (?) married Raymond Walter Krug, son of William H. Krug and Mary Alice Fish, on 24 June 1927 at Colorado. Name Variation Merton Edwin Krug was also known as Martin Edwin. Merton Edwin Krug was born on 14 May 1907 at Winfield, Sauk, Wisconsin. Merton Edwin Krug died on 25 December 1958 at bus accident, Mexico, at age 51. 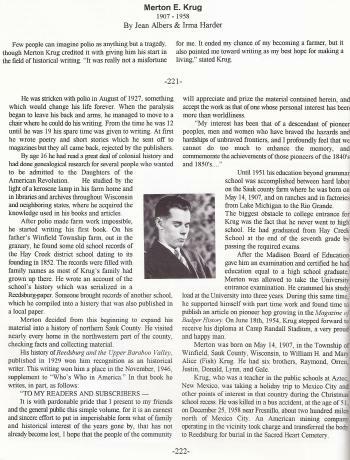 [S215] Sesquicentennial History Committee, Reedsburg Remembers 150 Years, pages 221-222. Orren H. Krug was born on 17 November 1909. Justin Leroy Krug was born on 11 April 1911. Donald Gordon Krug was born in November 1913. Lynn Marshall Krug was born on 24 April 1915. She was the daughter of William H. Krug and Mary Alice Fish. Gale Russell Krug was born on 12 October 1920. Gale Russell Krug married Ruth P. Pearson, daughter of Louie Pearson and Marie Thomas, on 30 December 1951. Gale Russell Krug died on 12 April 2000 at age 79. 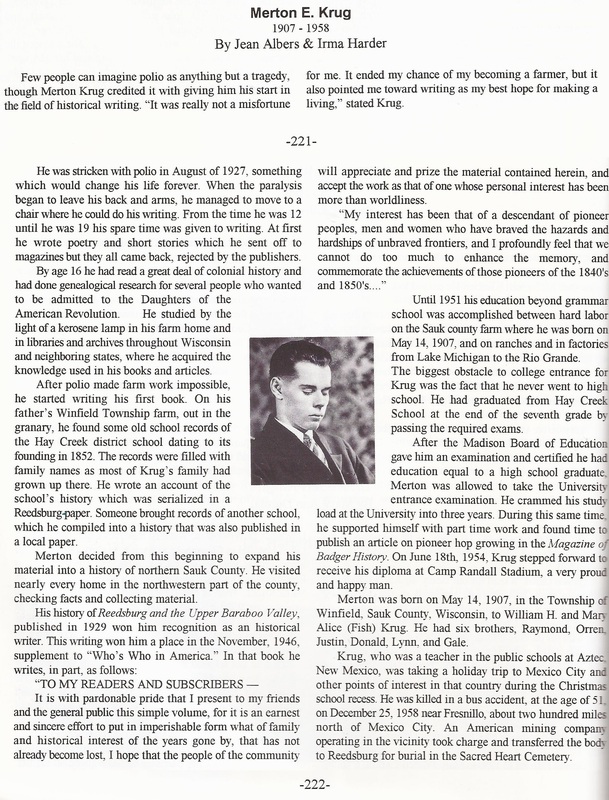 Gale Russell Krug graduated in 1938 at Reedsburg High School, Reedsburg, Sauk, Wisconsin. Frederick Harms married Dorothea Sophia Krueger. Frederick Harms and Dorothea Sophia Krueger immigrated in September 1866. Dorothea Sophia Krueger married Frederick Harms. Dorothea Sophia Krueger and Frederick Harms immigrated in September 1866. Fenton A. Leicher married Anna Krug, daughter of William Krug and Doris Hinrichs. Fenton A. Leicher was born on 20 March 1873. He was the son of Adam Leicher and Marietta Kendall. On 28 November 1931 at Reedsburg, Sauk, Wisconsin, attended Mrs William Krug (Doris Hinrichs) 77th birthday party. Robert Fenton Leicher was born on 29 August 1896 at Luverne, Minnesota. He was the son of Fenton A. Leicher and Anna Krug. Theodore Alfred Leicher was born on 21 December 1903 at Luverne, Minnesota. August Fritsch was born on 1 November 1867. He married Bertha Krug, daughter of William Krug and Doris Hinrichs, on 2 June 1903. August Fritsch died on 19 January 1922 at age 54. Paul Fritsch was born on 14 August 1905. He was the son of August Fritsch and Bertha Krug. Married Name 6 February 1926 As of 6 February 1926,her married name was Winkers. Louisa Fritsch was born on 2 December 1907. She was the daughter of August Fritsch and Bertha Krug. Hubert D. Krug married Elsie Meyer. Hubert D. Krug was born on 14 April 1882. He was the son of William Krug and Doris Hinrichs. Hubert D. Krug died on 4 August 1961 at age 79. [S355] Wisconsin Sauk Co Cemetery Records Vol 9, page 134. Married Name Her married name was Krug. Elsie Meyer married Hubert D. Krug, son of William Krug and Doris Hinrichs. Elsie Meyer was born on 8 October 1883. She died on 29 October 1963 at age 80. Walter Louis Krug was born on 6 November 1888. Walter Louis Krug married Frances Wallace, daughter of Nicholas Wallace and Anna Eastman, on 15 September 1923. Married Name 15 September 1923 As of 15 September 1923,her married name was Krug. Frances Wallace was the daughter of Nicholas Wallace and Anna Eastman. Frances Wallace married Walter Louis Krug, son of William Krug and Doris Hinrichs, on 15 September 1923. Nicholas Wallace married Anna Eastman. Anna Eastman married Nicholas Wallace. Russell Walter Krug was the son of Walter Louis Krug and Frances Wallace. Russell Walter Krug died at deceased. Name Variation Alma I. Hinrichs was also known as Alma M. Hinrichs. Married Name 16 November 1910 As of 16 November 1910,her married name was Heiden. Alma I. Hinrichs was born on 20 August 1890 at Reedsburg, Sauk, Wisconsin, also reported as Aug 1892. Alma I. Hinrichs married Albert F. Heiden, son of Frederich Heiden and Wilhelmine Bernien, on 16 November 1910. Alma I. Hinrichs died on 12 May 1985 at age 94. 1 June 1905 Reedsburg, Sauk, Wisconsin Alma I. Hinrichs appeared on the census of 1 June 1905 in the household of Frederich William Hinrichs at Reedsburg, Sauk, Wisconsin. [S355] Wisconsin Sauk Co Cemetery Records Vol 9, page 112. Albert F. Heiden was born on 1 April 1878 at Ironton, Sauk, Wisconsin. 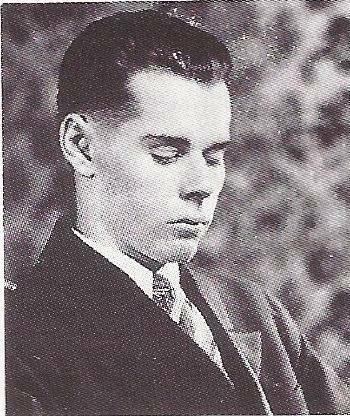 He was the son of Frederich Heiden and Wilhelmine Bernien. Albert F. Heiden married Alma I. Hinrichs, daughter of Frederich William Hinrichs and Dorothea Sophia Katherine Schroeder, on 16 November 1910. Albert F. Heiden died on 1 April 1952 at age 74. ALBERT HEIDEN , son of Fred and Wilhelmine (BERNIEN) HEIDEN, was born April 1, 1878, town of Ironton; married Nov. 16, 1910, Alma HINRICHS, daughter of Fred and Dora (SCHROEDER) HINRICHS. She was born Aug. 20, 1890, town of Reedsburg. They have one child, Milda Dorothy, born Oct. 5, 1919. Name Variation Frederich Heiden was also known as Fred. Frederich Heiden married Wilhelmine Bernien. Frederich Heiden was born on 2 November 1847. He died on 20 October 1923 at age 75.